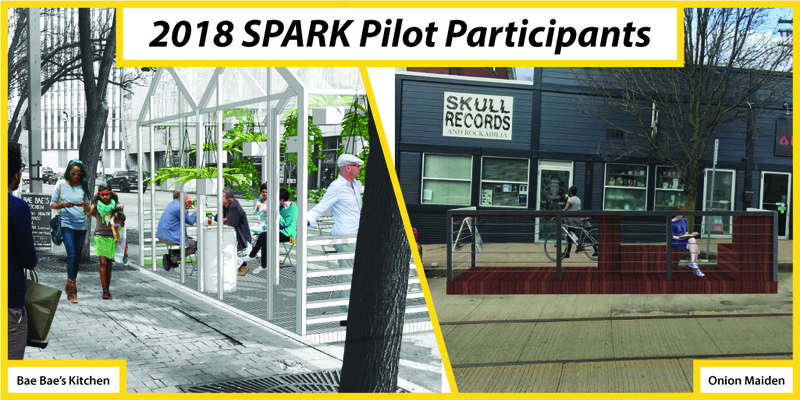 Mayor William Peduto and the City of Pittsburgh are excited to announce the initial two applicants in the 2018 Spark Pilot Program, which will create small street parks outside businesses in Downtown and Allentown. "The streets and sidewalks around our neighborhood business districts are often untapped resources. The Spark program is a new way for all Pittsburghers to think creatively and re-use public space," Mayor Peduto said. The City is testing the program with two applicants before opening the program up citywide. The initial two applicants are Bae Bae's Kitchen at 951 Liberty Avenue Downtown and Onion Maiden at 639 East Warrington Avenue in Allentown. Resolutions approving both Sparks will be introduced to Pittsburgh City Council tomorrow. Bae Bae's Kitchen is proposing building a small greenhouse with seating in a parking space in a short block of Liberty Avenue with dedicated 24-hour parking. The greenhouse will feature an integrated rain barrel for watering plants and feature movable tables and chairs. Kitchen employees will maintain the greenhouse and the Pittsburgh Downtown Partnership will store the structure in the winter. The location of the Spark compliments the PDP's Life on Liberty initiative, which seeks to prioritize pedestrian connections and safety, create dedicated transit amenities, reduce sidewalk congestion, and increase business opportunities in the area. In Allentown a steel and wood deck with seating is being proposed in a space in front of Onion Maiden and neighboring Skull Records. It has the support of the Hilltop Alliance, the Allentown CDC, the Allentown Business District Committee and adjacent property owners.